The latest edition of the Humble Bundle – number six for those that are counting – is now available, offering the usual array of top indi titles for a pay-what-you-want price. The games available this time around, include Dustforge, Rochard, Shatter, S.P.A.Z, Torchlight and if you pay over the average – which currently sits at a paltry $5.74 – you’ll get Vessel included. While most people might only be paying a couple of quid for what ammounts to tens of pounds worth of games, the number of purchases is already over 134,000, leading total payments to not be far from reaching $800,000 (£490,000). Windows users should as usual, be ashamed of their paltry contributions, with the average at the moment sitting just above $5 (£3). Mac users are a little better, with the average purchase for them going for $6.78, while Linux users show they’re either the most generous, or have the most cash in their pockets because they didn’t pay for their OS, with an average purchase price of $9.54. No sign of the HumbleBronyBundle or Notch contributions yet, though it wouldn’t be surprising to see them appear in the next few days. That’ll add another few thousand to the total. 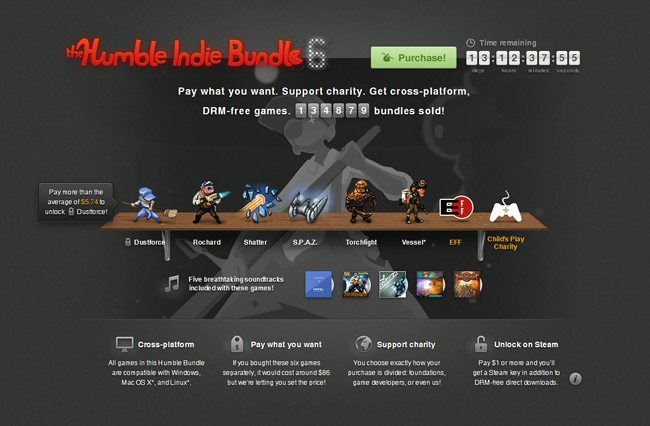 For those living under a rock for the past couple of years, the HumbleBundle offers several popular indie games for whatever price you’re willing to pay, with a minimum of $1 if you want a Steam key. The games work on Windows, Mac and Linux and have no DRM at all. A portion of the purchase price also goes to charity.